What information do I need to give you before asking for a quote? a)	Let us know which voice talent(s) you would like. Once we have a shortlist, we’ll advise on availability. How do I choose a Voiceover Artist? 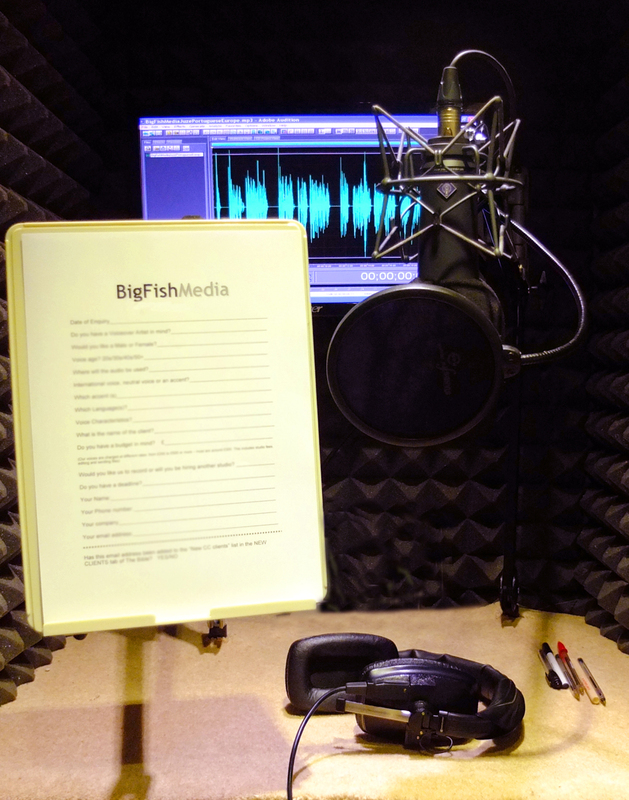 Why should I use BigFish Media for voiceovers? We are fast, friendly and efficient with great voices at reasonable prices. Just choose your voice from the selection of Voiceover Artists and leave the rest to us. You don’t need to worry about booking a studio either - unless you want to. Using our studio is also a lot cheaper than hiring a third party studio, especially if they are in London. Our prices also include an experienced engineer/director to help you get the best out of the voice talent. How will I know if the voiceover is the right one for my project? If, after hearing the voiceover samples on this site, you are still not sure if they are the right voice for the job, we can send you a few short bespoke demos free of charge. But are you any good at voiceovers? Hundreds of our previous clients think so and we have been in business since 2004. We also use experienced radio and TV presenters and actors who are used to "lifting" the text off the page and making your script sound interesting, natural and engaging. Just have a look at our testimonials page. How can I be sure that what you record will be how I want the voiceover to sound? Once you have commissioned us to record your voiceover and we have agreed a price, we will take some time to discuss the script and any difficult pronunciations, and technical terms, to make sure we get these correct. We would encourage you to listen to - or direct the session - either via the telephone, Skype, ISDN or in person at our studio near Woking (pictured). If you can't do this, our preparation can prevent re-records and amendments later. We could also record more than one version of a sentence or paragraph, giving you the opportunity to use the one you prefer. We will also discuss the style and tone that you require for the voiceover. Or you could have another listen to the showreel and tell us to record in a particular style. Is there an additional charge to direct the voiceover session? No. This is included in our quote. If you really don't want to direct, we may be able to supply recordings by some voices – with no client direction – at a cheaper rate. It is important that whoever has sign off on the audio listens into the session. You have indicated that you don’t wish to direct. If you don’t listen in, and you are not happy with the tone, pace, pronunciations or the way acronyms or phone numbers are read, we will also have to re-book the voiceover artist and this will incur another session fee. You may also miss your deadline. We will fix any technical issues free of charge of course. How much do you charge for voiceovers for adverts? 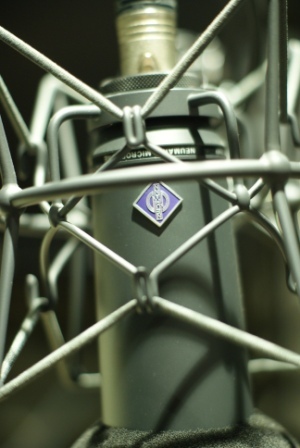 For voiceovers for radio commercials in the UK we charge the station rates based on the Agent Equity ratecard. For TV commercials and radio stations outside the UK,please ask for a quote. You don't need to know this, but it stands for Integrated Services Digital Network and it has revolutionised many business activities throughout the world. In practical terms, it means that you can hear our voiceover artists in our studio in Surrey as if they were with you in your studio. You can produce the session and we can talk live down, what are in effect, very high quality telephone lines. That’s no problem at all, we can send your audio (mp3 files, wav files or aiff files) to you via FTP or via Dropbox. We are hooked up to the internet via 39MB fibre optic broadband. 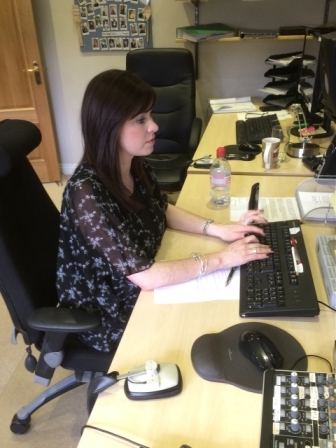 We also produce sessions via ipDTL which is the equivalent of ISDN but over the internet. It stands for File Transfer Protocol but you didn’t need to know that either. As email can only handle small MP3 files, we use this little bit of software as a way of transferring large wav files from our computer to yours. You will need to visit the Client Area of this website, enter a username and password (which we will give you) and then you can download your audio. It’s simple. Honest. Alternatively we can transfer the files to you via Dropbox if you need to maintain complete confidentiality. I still want to hear you record the voiceover. Can I do that? Yes. If you would like to produce the session, you could either listen on the telephone, on Skype or you could visit our office and studio in Surrey. What equipment do you use for your voiceovers? What audio format can you supply your voiceovers in? Our default audio file is wav. We can also y your audio in high quality MP3, wav or AIFF. Please ask if you require an alternative file format. I have already made a video, can you make your voiceover fit? Yes. We have "Voice-to-Picture" facility in our studio (pictured) to enable the voiceover artist to record your script so that it fits your pictures perfectly. This "sync" process is much more time-consuming process and may cost more than recording "wild" (not to picture). What happens if you make a mistake in the voiceover? We want you to be delighted with the voiceover audio but if, for some reason, we made a mistake, then we will correct it free of charge. We encourage you to listen to (or direct) the session to prevent mistakes happening. This also means we can meet your deadline. But what if I change my mind and what to alter the script after you have recorded it? That depends on the voiceover artist and how the recording session is carried out. Sometimes we will be able to include one set of re-takes for free. Sometimes this will incur an extra charge. How quickly can you get the voiceover job done? Fast. Normally within 3-4 days of commissioning the session and often within 24 hours. However this will depend on the availability of your chosen voiceover artist and how busy our studio is. You could give us a script in the morning and have the audio sent back to you by the end of the day via our FTP or Dropbox. Sometimes of course the project is very big and will take days to record and edit, or if a particular voiceover artist you require is unavailable you may have to wait; talented people are often in demand. How much will the voiceover for my project cost? That depends on how long the script is, and what you would like to use it for. If you would just like some voiceovers for your on-hold telephone service, prices start at £100 + VAT. Most scripts for corporate videos are under two thousand words. That means that the audio we send you, the “Finished Audio”, will be up to ten minutes long. Prices for one script start at £250+VAT. The average fee is £350+VAT. There may be extra “usage” fees for use of the audio on the internet, depending upon the size of the end client and the voiceover artist chosen. Please visit our ratecard page or contact us for more details. “Finished Audio” is the recording of your script, edited and de-breathed. It’s the final masterpiece for you to use. So when we talk about 10 minutes of Finished Audio, this is how long the voiceover will be, as opposed to how long it will take to prepare the script, record it and edit it which will, of course, be much longer. Our average fee is £350+VAT for one script. This fee includes the voiceover fee, studio fee, editing, de-breathing, file encoding and transfer. But I have several short scripts that you could easily record in an hour, will that be the same price? Possibly. It depends upon the end client, where the audio is to be used, which voiceover talent you would like and if this is a wild or sync recording. Just let us know your budget and the type of voice you would like and we'll negotiate with the talent for you. We don’t think so. You may be able to find voiceovers cheaper elsewhere, but you will certainly be able to find more expensive voiceovers. Our price also includes an experienced engineer/director to help you get the best out of the voice talent. Ask yourself about the quality of the voice and how the artist interprets a script and lifts it off the page. Is the voice really good enough to represent your company or product? What about the acoustics of the audio? Can you hear cars driving past in the background? Or planes flying overhead? Is there a buzz or hum on the recording? With a professional voice artist and proper equipment, you should hear nothing else on the recording except the voice. Any professional will be happy to provide you with a showreel or a demo recording of what your script will sound like, so that you can check these things. You can Make A Payment by PayPal and most major credit cards. You can also pay by cheque or BACS (online banking). Our payment terms are 30 days. If you have no credit history with us, or you are not based in the UK, we require payment before arranging the voiceover session. Ok, I am convinced, can I book a voiceover artist today? That’s great. Yes you can, please email us or call us now. Oh, just one more thing, how can I become a Voiceover Artist? Please read our voiceover advice page.